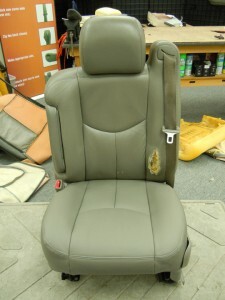 Here’s the deal…Today, at The Seat Shop, we did a driver bottom leather seat cover install on a 2005 Chevy Tahoe. The interior color was Pewter (grey). 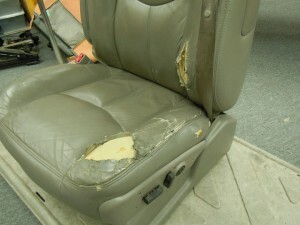 Although both the bottom and top were torn up, the customer was just replacing the bottom for now, until he can gather up some additional money to replace the top. The only thing we did to the top seat cover was clean and condition it using our cleaning and conditioning method. Once we did that, and replaced the bottom, the color match was spot on. 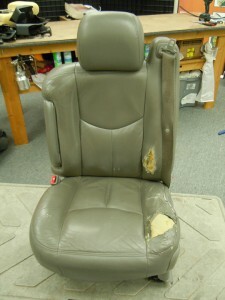 If you have any questions about replacement leather seat covers that match with the OEM interior, please visit our website at www.theseatshop.com, or give us a call at 214-710-2565. Here are some before and after pictures of the install, enjoy!